Search engine optimization is free and easy with SEO PowerSuite - an SEO toolkit developed by a team of world-class SEO technology experts at Link-Assistant.Com. What you get the best of IT and online marketing blended into one muscle-thick SEO software pack that costs you 0 - nothing at all. - Is SEO PowerSuite yet another worthless SEO freeware? - Far from that: the toolkit comes with 4 feature-rich SEO tools for total on- and offpage optimization of your site. 1. Rank Tracker tool arms you with great keywords and checks search engine rankings. 2. SEO SpyGlass tool finds backlinks, yours and your competitors'. 3. LinkAssistant tool makes it easy to launch and manage your link building campaign. 4. 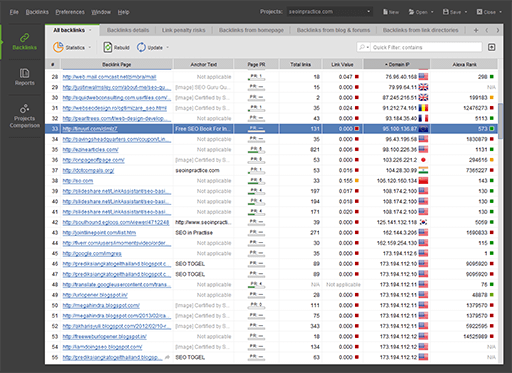 WebSite Auditor tool analyzes your entire site structure, making it 100% bot-friendly. Supporting 750 search engines, SEO PowerSuite tools are perfect for both local and international SEO. Plus, the tools are available in world's 7 most commonly spoken languages: English, Spanish, French, German, Dutch, Russian and Slovak. Talk about huge SEO opportunities! - SEO reports with visuals & site-specific search engine optimization advice. - Advanced search safety features eliminating search engine blocks and guarding your IP privacy day and night. - Frequent updates for spotless data accuracy. - Constant feature add-ons essential for today's rapidly changing SEO ballgame. - Friendly and highly trained customer support to help you with your SEO every day. And here is the feature you are going to love: connect your Google Analytics account with SEO PowerSuite, and you can track how many site visits each backlink and keyword brings to your site. Give SEO PowerSuite a go and enjoy the most effective SEO software solution for your online business.